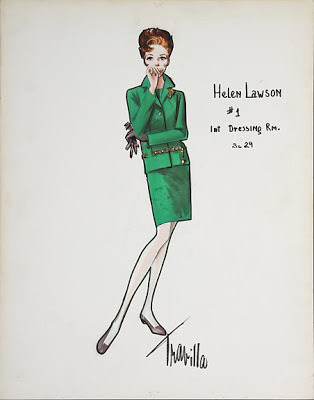 Of the eventual one hundred and thirty plus costumes created for "Valley of the Dolls," only four of them would be worn by the character of Helen Lawson - a tough-as-nails Broadway actress who'd earned her place at the top. More of a cameo role with a few (memorable) scenes and one musical number, it would take just the right actress for the part. 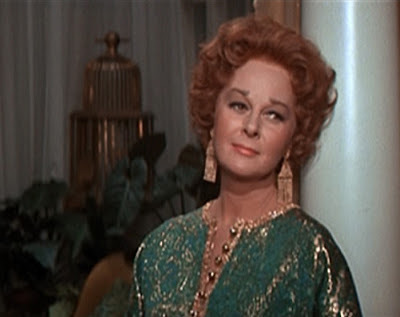 Supposedly based up Ethel Merman with whom Susann had crossed paths with in the theater on more than one occasion. 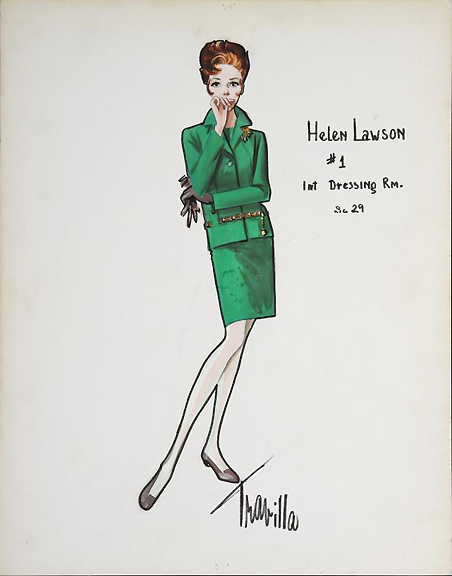 Travilla described her to the press as "Helen Lawson is an old, "slipping" Broadway warhorse, holding her position in the theater by the skin of her teeth. She's a crude, rough, selfish, hard-bitten woman, who fights using every dirty trick she knows, and she knows all of them. A foul-mouthed, ruthless woman, completely without taste or finesse. And whatever she wears is the most expensive and the most vulgar. She comes on like gang-busters--like a scream. I dress her just that way." 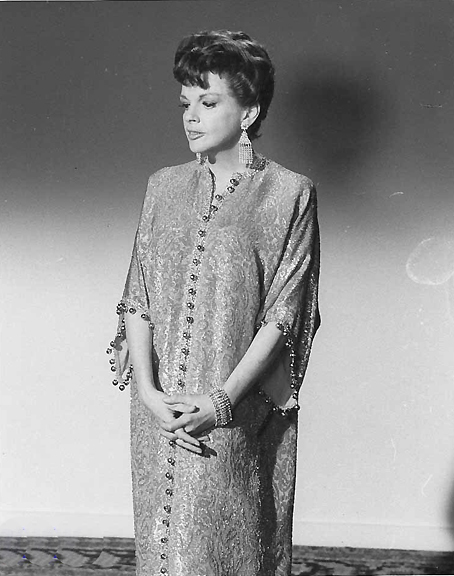 Originally hired to play was Judy Garland - ironic casting since many felt the book's character Neeley O'Hara, was a thinly disguised version of Garland's early career and addiction to pills. Garland struck Travilla as "a tragic figure, so nervous and frail. She was literally wasting away. It was if there was no life left in her skin; her body dissipated. *" But he designed outfits that would conceal those imperfections and give an aura of strength. Not the final pattern for Garland's gown, but did appear on Barbara Parkins during the "Gillian Girl" commercial within the film. I can just imagine how colorful the original is. 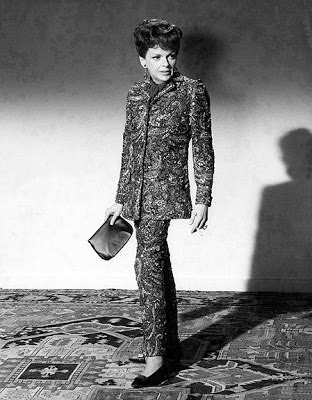 Judy completed all of her hair, make-up and costume tests for the picture on April 14, 1967. Color footage shows Garland having a pleasant time, joking and laughing with the crew. 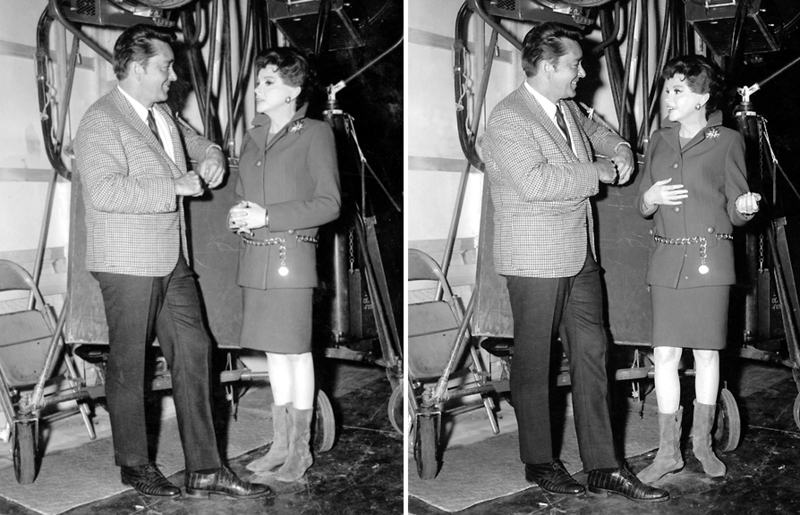 Photos were also taken of her with Travilla as they conversed in a corner of the soundstage. And then I said "If one more Munchkin tries to look up my gingham..."
There were frequent delays during Judy's first few days of scheduled filming. 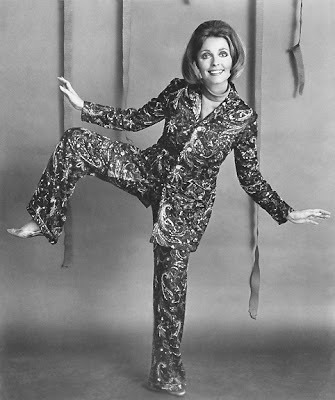 Patty Duke claimed the director kept her waiting till 4:30 in the afternoon, though she'd been on-set and ready since morning. Sitting in her dressing room only intensified her fears of performing and she medicated with both pills and alcohol. 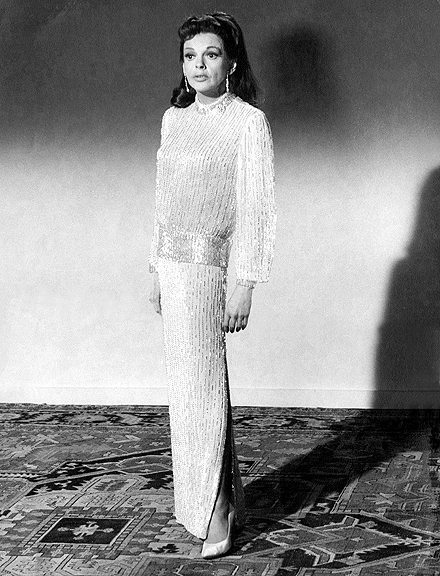 Garland only completed one day of filming, the scene in which her character is introduced. The footage has never been shown and at the time was labeled unusable. Very similar to Marilyn Monroe's unseen footage from 1962's "Something's Got to Give." Later to be proven untrue when Fox assembled and released the footage on DVD. Much could also be said of her recording of "I'll Plant my Own Tree." Nowhere near a finished product and certainly would have been rerecorded had she completed the project. The video below features a few shots taken of Garland during filming. 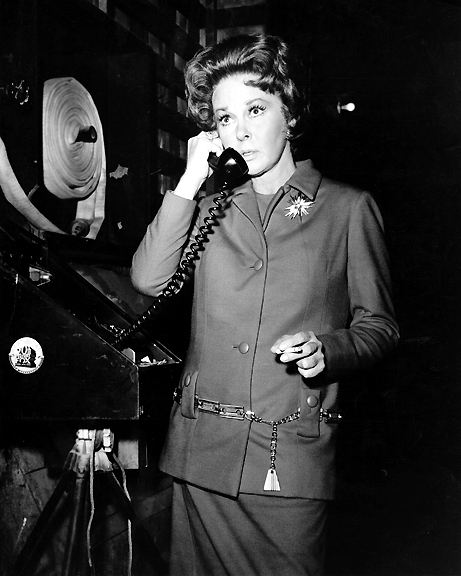 There are many versions of how Garland was finally let go from production, including published reports "that she held up filming when she lost a cap from a tooth, received a phone call during filming that a close friend had tried to commit suicide and was too distraught to continue and well meaning people wouldn't stop asking her if she didn't feel an idnetification with the character in the film, an aging, one-time great star on the skids." 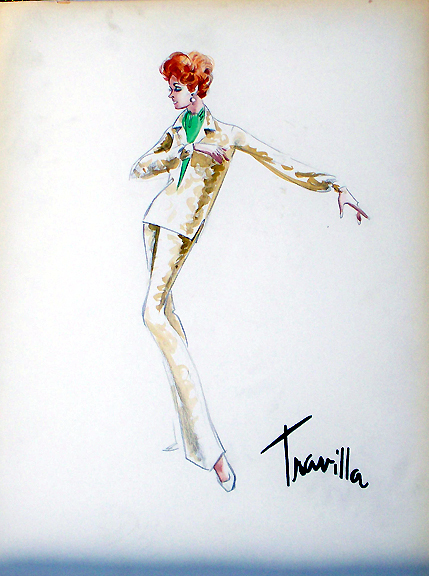 Travilla was one of the first people she called when the rumors of her dismissal were circulating. "I went along with her . . . that I couldn't believe they had fired her... (and said) the way to hear about it was from the producer. Then I called up the producer straight away and told him to expect Judy to phone him. I let him know she was terribly upset and had been crying on the phone to me. "* Patty Duke remembers Mark Robson the director didn't even tell her himself, he had someone else do it. Garland crumbled. 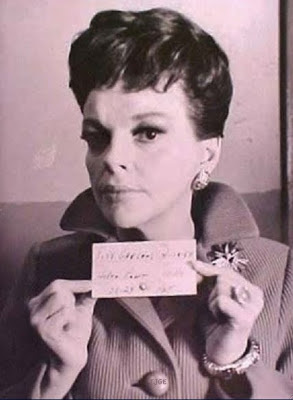 Mid-May newspaper reports state that "The entire 'Valley' company is in the dumps about Judy, from the executive office down to the props and grips. Everything had been set up to keep her relaxed and happy, even to putting a pool table in her swank dressing room. It's been moved out along with all Judy's personal belongings: pictures of her kids in silver frames, a portable piano, her record player and all the gowns designed for her by Bill Travilla." Whatever the actual reason for Garland leaving "Dolls," a replacement had to be found. Bette Davis was briefly considered, and would've been an interesting choice. But the role went to Susan Hayward, who hadn't made a film in four years. Travilla did something unusual in that he flew from Los Angeles to Haywards home in Fort Lauderdale Florida to show her his ideas for her costumes. 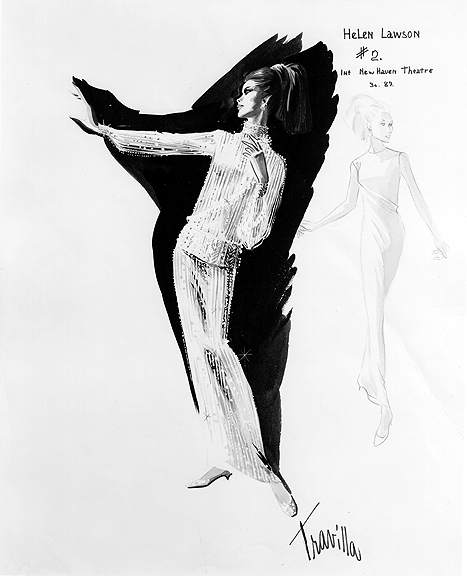 Hayward's husband had recently died and the studio wanted to make things easy on the new widow. 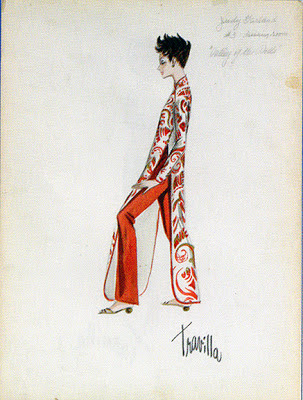 However, things didn't go smoothly when Travilla told his pattern cutter Oleta Robinson, of the trip. "I know that Travilla was looking forward to working with Susan Hayward as he had worked with her before (1951's "David and Bathsheba") and had a good relationship, but this time did not go well, unknown to everyone, she had a brain tumor and was difficult to please . Her favorite quote to describe each dress was 'It's a dog. I wouldn't be caught dead in it.'" 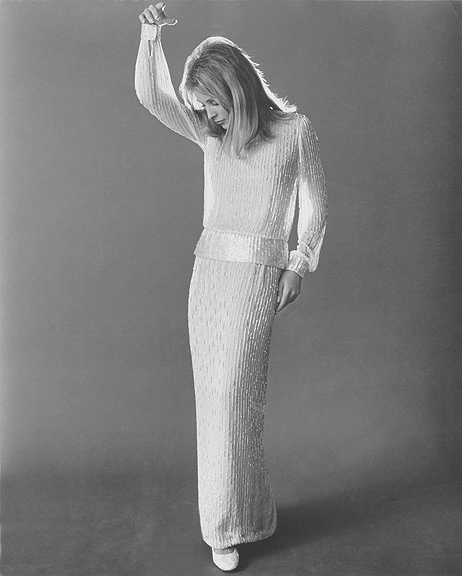 But once Hayward got to Los Angeles, she became the ultimate trouper, telling the press "It's great to be back at my home studio -- as long as I know I can go back home again. It's fun doing a small part, two weeks in Hollywood and then back to my lovely house in Fort Lauderdale. The strangest thing's happened: I've learned I love to fish." She added. 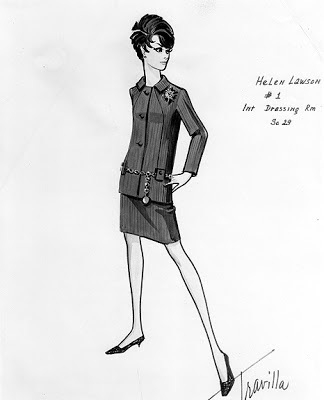 "Helen's much unlike me. For one thing, she'd never go fishing. She's not exactly a person you'd take home to mother. She's a woman with a backbone of steel." As for her own singing in the film? "I love to but time won't permit it. First I'd have to give up these coffin nails for my voice and second, get back with my singing coach. 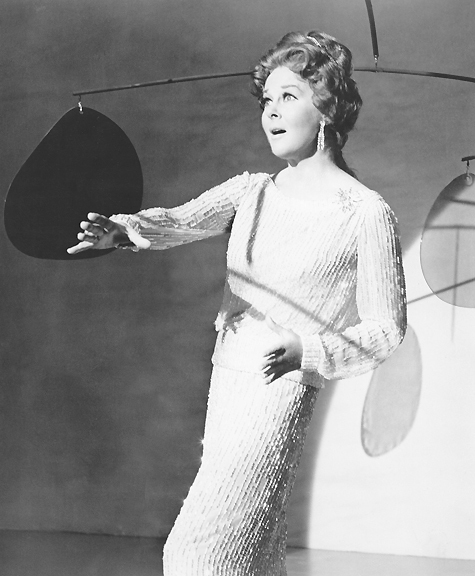 Instead, my favorite, Maggie Whiting will be doing the singing for me." Hayworth's opening scene, where Travilla's use of bright red indicates she's definitely no one to mess around with. You can notice in the front where the padding has been removed. 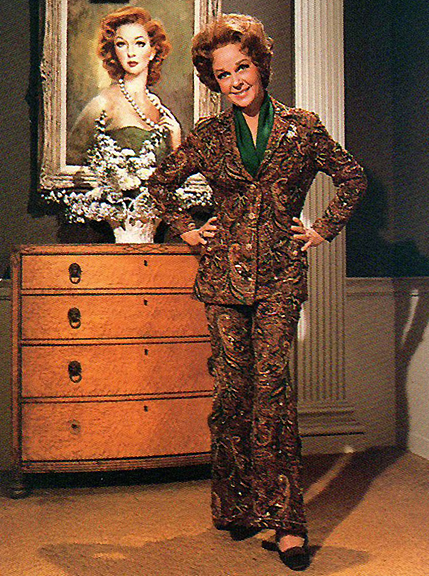 Hayworth in Garland's dressing gown. However, one costume had to be created from scratch. The heavily beaded paisley print pantsuit. And not for the reason Barbara Parkins repeats on the VOD DVD commentary which was Garland stole the sequined pantsuit along with her other costumes and wore it onstage during her concerts to spite them for firing her. 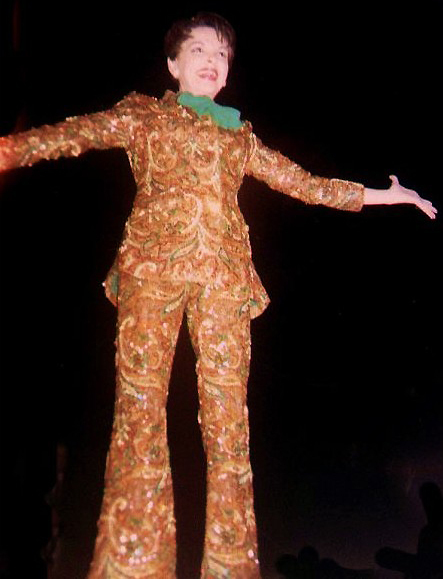 Garland onstage wearing her VOD pantsuit. Total rubbish. Printed reports have 20th-Century Fox GIVING the one made for Garland to her along with paying her full salary. She then ordered one in red and one in white from Travilla at $1500 each. Hayward models the pantsuit on-set. 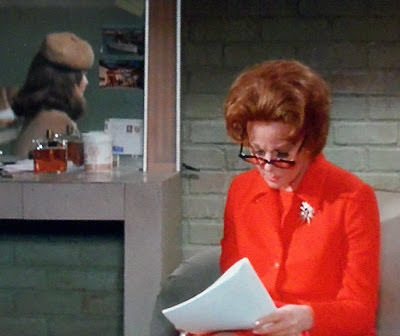 Notice the prop painting of a young Helen Lawson. 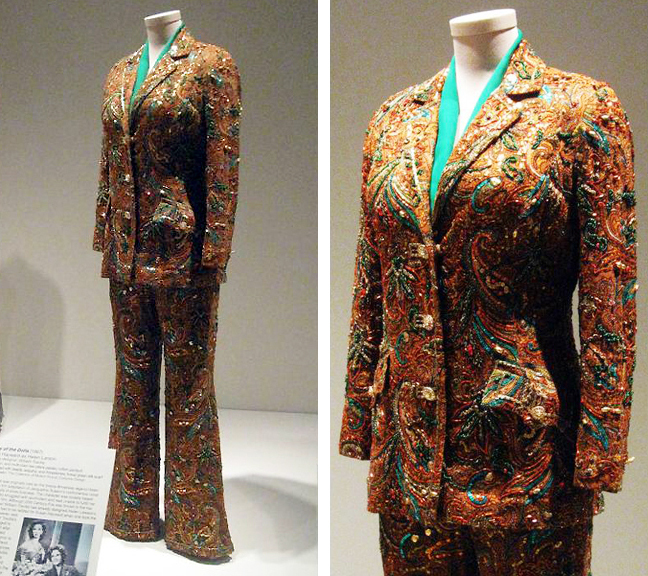 Haywards suit on display in Oklahoma. Hayward didn't believe in ladies wearing trousers and never wore them herself, but eventually grew to love the outfit so much that she personally modeled it at a fashion show promoting the film and Travilla's VOD based line held at New York City's Plaza Hotel in the Summer of 1967. Sharon Tate having a bit of fun during a photoshoot wearing both the pantsuit and "Plant my Own Tree" gown. I own the costume sketch of Judy Garland in the red/wht tunic. 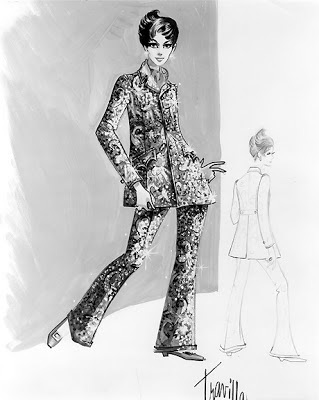 Also a sketch of Judy Garland in a dress made of the green paisley fabric from the pant suit. I love them, they are beautiful.